Welcome to Cloud House Farm, a secluded mountain yurt hideaway located deep in the hills of the Andalucian Rio Genal Valley just 1hr from Ronda, close to the white washed village of Genalguacil and set against the spectacular backdrop of the Sierra Bermeja Mountain range. Perfectly located for adventure and discovery amongst Andalucia's most spectacular hiking routes, Cloud House Farm offers a unique yurt holiday experience way off the beaten track. Featuring its own natural spring, the yurts are completely off grid with solar panels as their main energy source. Cloud House is proud to open its hand carved gates this year to those wishing to truly escape from it all, to reconnect with nature and explore a yurt sanctuary amongst the trees, where river pools and rope swings are never too far away. Set within 17 acres of mountainous cork oak forest, our handcrafted Mongolian Yurt offers an intimate haven amongst the trees. Here you can enjoy the thrill and tranquility of sleeping under canvas in a luxurious felt lined Yurt complete with its own access, wooden deck platforms, private outdoor kitchen and shower house. 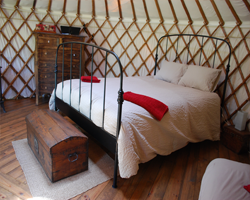 Yurt holidays by Cloud House.